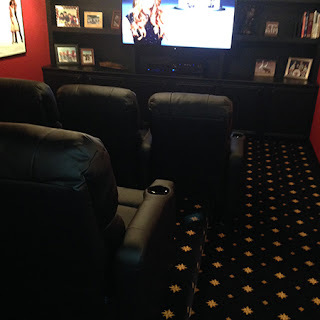 4seating.com Blog: Why Build A Home Theater? COST: The prices of many consumer goods are skyrocketing far past the rate of inflation, and movie tickets are no exception. It is predicted that within five years, adult ticket prices will land at $20--and for movie buffs who like seeing a new movie a week on average, that's going to translate to a huge hole in their wallets. If you have a family, costs are going to be even higher. Defenders of the theater experience often cite the large screen and superior sound systems that theaters provide: but just how close are home theaters now to matching this? Answer: with jumbo flat screens and 5.1 surround systems, very close. CONTROL: This is your home theater, and with the ease of pushing a remote button, you can control the brightness, audio, subtitles, sound, contrast, or anything else to your own individual requirements. 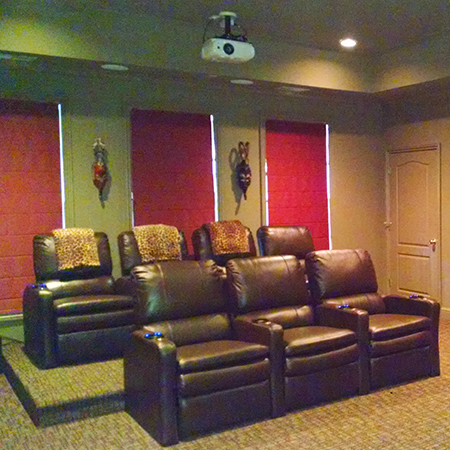 You can position just how close or far you sit, where to best place the 5.1 surround system, and much more. NEVER MISS A FRAME: Have you ever had the urge to use the bathroom in the middle of a movie, but held it in for fear you would miss a key scene? Not at home--the pause and rewind buttons are now at your fingertips. NOISE: The communal experience of watching a film with a large group of people used to be one of the upsides of the theater experience, but audiences these days are more inconsiderate than ever before. They talk and text on their cell phones, throw food around, and then shush the person next to them when they stop talking long enough to want to hear what’s going on. Who needs it? INTIMACY: Getting intimate at the movies used to be another enjoyable facet of the theater experience, until everybody started to want to get in your business. Never have to worry about uncomfortable stares when you and your loved one just want to feel the romance. 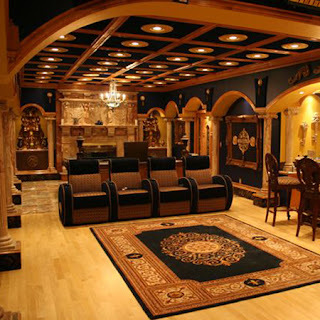 DÉCOR: This one is an obvious advantage to a home theater--you are completely in charge of how your theater will look, right down to the carpeting, wall panels, paintings, speaker placement, accents and more. 4seating offers an array of these decor elements on our website, and can even help you custom-design the theater of your dreams. YOU SAVE ON COST, PART II: The last time this author bought a single candy bar at a movie theater concession stand, he paid $4.50. Most movie theaters don't allow you to bring food from home, because they make most of their money not from showing the film, but by gouging your pockets at the stand. Never have to feel guilty again about sneaking in food, just because you don’t want to pay $6 for a below-average hot dog. Bring your own snacks to your home theater--or even eat dinner on a tray table attached to your seat--snacks that are way cheaper, to boot. PRIME SEATING: Attend the screening of a popular movie on opening weekend and chances are, you will be sitting in the nosebleed aisles, straining your neck just to see what's going on. Wait until it's out on DVD/Blu-Ray, and you can be front-and-center to the action every time, with a full theater setup at your disposal. Even better, with the groundbreaking online premiere of The Interview, other movies may soon find their way to online premieres, which means that with a simple hookup of your tablet or laptop to your screen, you can be there for the premiere right at home! KIDS: Those of you with families know how hard it is at times to bring children to a movie. If they’re bored, they will want to get up, talk, and run around, bothering other audience members. With a home theater, your children will have the freedom to do as they please. HOME THEATER SEATS ARE BEST: At the risk of tooting our own horn--but it's very true, as anyone who has sat in one can attest--the kind of plush feel you get from a home theater seat is light years beyond even the best movie theater chairs. You can relax, recline, and utilize any number of convenient accessories (wine glass caddies, tablet holders) for an experience unlike any you will receive at an actual theater.